A COLLECTION of still photos, merged together in video format has revealed gradual but drastic erosion to the Noosa River mouth over the past 46 years. Local Jim Upton sourced the stills compiled in the video to show an "objective" view of mother nature and human intervention at work. The blogger and drone photographer said most of the changes came through the "Frying Pan" - which broke through late last year. Mr Upton said vegetation on the north shore of the river mouth was under threat from erosion and that trees on the foreshore were being swallowed up. Noosa river mouth: A COLLECTION of still photos, merged together in video format has revealed rapid erosion changes to the Noosa North Shore from 1902 to 2018. Imagines compiled by Jim Upton. "Parts of the erosion on Noosa North Shore, it has never been eroded like that before, a couple of private blocks of land might be getting nervous," Mr Upton said. "The course of the river mouth through the Frying Pan changes quite rapidly. "Whether it will move back or keep pushing through will be interesting to see in the next couple of storms. "The video is interesting and topical. Do we leave it alone and let it run its course or do something?" Last year Noosa News reported the Spit has been eroding at a rate of 27,000 cubic metres a year and will cost more than $280,000 to manage. The Noosa River is a dynamic system and movement of sand and shifting channels at the mouth of the river will occur naturally. Noosa Mayor Tony Wellington said the construction of the artificial construction built in the late 1970s - known now as Noosa South - changed the dynamics of the river mouth. 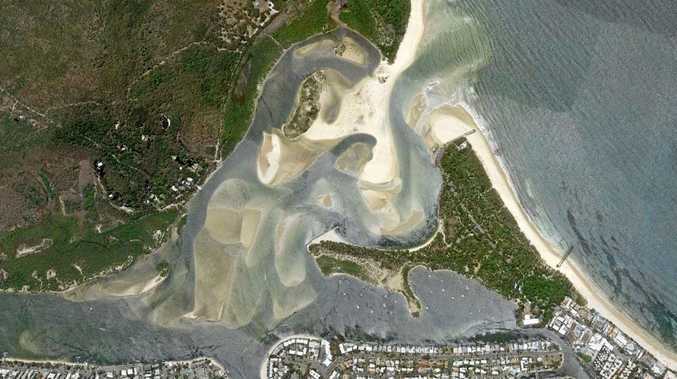 Should more be done to protect the Noosa River mouth? I'm not sure what could be done. No, erosion happens over time. In early 2018 Noosa Council staff conducted a Shoreline Erosion Management Plan to address "priority erosion issues and the recommended management options". "The options are underpinned by sound science, coastal engineering principles and community values," Cr Wellington said. "The focus of the plan will include the northern side of the river at Noosa North Shore, including the Frying Pan area. A tender for the work is currently being prepared. "What is clear is that any intervention in a natural system such as a river mouth is likely to have consequences. "The construction of the Doggy Beach protection works by the Sunshine Coast Council during the period of amalgamation has arguably resulted in changes to the dynamics of the river mouth. "Before any further action is taken, council wants to be certain that the intervention is warranted and that we are better informed about possible impacts of such works."